This cake was made by a student in a workshop several years ago. It is still a lovely cake. 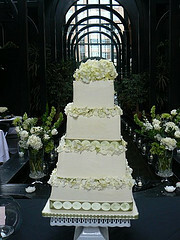 The following recipe will make a cake that is the size of the top three tiers of the cake in the photo. It is advisable always to make separate batches of cake when you get into the larger sizes of Red Velvet. When you are making a large amount of Red Velvet cake, it is wise to sift the baking soda in with the dry ingredients and then right before pouring the batter into the cake pans, fold and stir in the white vinegar. Vinegar and baking soda mixed together is a chemical reaction that is suppose to occur during the baking process. If you have too much batter, you might not be able to pour the batter in the cake pans fast enough. Your cakes may fall or never rise. Prepare cake pans by lightly brushing and wiping unsalted butter around the walls of the cake pan and lining the cake pans with parchment paper. Dust the cake pans with a little cocoa powder which gives a lovely dark finish to the sides of the cake. 3 – 6” square pans which will be filled with 8 ounces of batter each. 3 – 8” square pans which will be filled with 14 ounces of batter each. 3 – 10” square pans which will be filled with 1 pound 6 ounces of batter each. Alternate the dry ingredients into the oil/egg mixture with the buttermilk and blend on low until the batter appears to be smooth and scrape down the batter and blend until smooth. Have all your pans ready for weighing at the scale. Remove bowl from mixer and at the very last minute add the vinegar. This process is done this way because of the amount of batter you have to weigh for the pans. If you were to add the vinegar and baking soda in the traditional manner by mixing the two together you would have the chemical reaction take place too quickly and your cakes might collapse or crater. You still get the nice texture from the vinegar and a slight tang but you will not run the risk of failure. Bake time is approximately 25 – 30 minutes depending. Always test for doneness. Put the cream cheese and butter in the bowl of the 20 quart and blend until smooth. Add the vanilla extract and lemon juice. Add the confectioners’ sugar a cup at a time and taste for sweetness as you do not have to add all this sugar if you might prefer this filling to be less sweet. Prepare three square cake pans by lining them with plastic wrap. You can cut square cake boards out of double thick cake pads used for sheet cakes using the square cake pans as the template. Trim each layer of cake and place one layer in each cake pan. Brush with plain simple syrup. Pipe a dam of Italian meringue buttercream around the edge of each layer of cake and fill with cream cheese filling. Continue and build each tier of cake. Wrap and chill the cakes in refrigeration for at least an hour. Ice as you would any tier of cake. There are tricks to icing square cakes. One such trick is to place an inverted square cake pan onto a cake turn table. This will allow you to extend your cake turn table enough to give you an edge to work on. My student is icing a square cake on an inverted cake pan on the turn table. She is using a speed tip as well. To properly use a speed tip..that really wide tip you may see cake decorators use at the supermarket, hold the tip close to the cake to get a thin line of icing with each line. 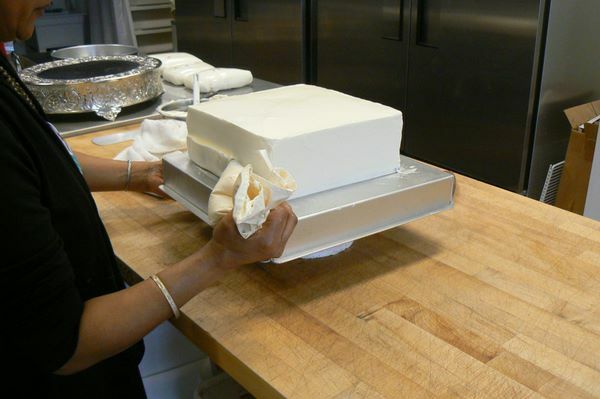 Use a spatula to move your icing around your cake tiers and then a bench scraper for the finish work. Pull the icing into the center of a square cake from each corner to get sharp corners. With a little practice you can learn to ice artisan wedding cakes in no time at all. 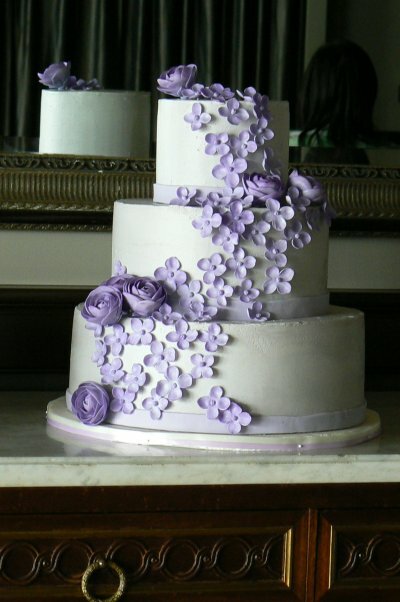 The cake pictured on this page has dozens of gum paste purple hydrangeas and several stylized roses also in purple. The Italian meringue buttercream is tinted with Regal Purple gel color. The best way to color Italian meringue buttercream is to add a bit of sifted powdered sugar before adding the gel color. This will make your color much more vivid. The cake is a Banana Cake that I have tweeked to lighten it up. Because the original recipe called for only mashed bananas being the moisture in the cake, I have added buttermilk to lighten up the end result and added banana compound which is a rich intense banana compound made in Switzerland. I purchase Hero brand Banana Compound through Peterson Cheese Company in Auburn, WA. This supplier carries many fine imported products and the Seattle region is fortunate to have this resource available. Each recipe I post will explain where you might be able to find the materials used in the recipe and the best products that I have found for these recipes. Preheat oven to 350 degrees. Prepare 2 – 10 inch cake pans with pan spray and a round of parchment. Add the sifted flour to the banana/butter mixture and mix on low until just combined. Divide between cake pans and bake 30 minutes or until done when a toothpick inserted comes out clean. Put the milk and heavy cream into a 4 quart saucepan and scrape the contents of the whole vanilla bean into the milk. Heat until the milk begins to boil. While the milk is warming up, in the bowl of a heavy duty mixer, mix together the 2 yolks, the whole egg and the sugar and beat until they become light in color and thick. Stop the mixer and add the 2 Tablespoons of flour and 2 Tablespoons of cornstarch and beat until the mixture becomes even thicker and lighter in color. Pour a small amount of the hot milk over the egg mixture and blend thoroughly. The mixture is now tempered and you can add the rest of the hot milk to the egg mixture. Pour the milk/egg mixture back into the saucepan and over a moderate heat, whisk until a bubble appears and the cream has become very thick. Pour this into a shallow plastic pan and immediately place plastic wrap over the surface of the cream and refrigerate. If you do not place plastic wrap over the pastry cream, a skin will form and the end product will not be smooth and lumpfree. Whip 1 1/2 cups heavy cream to the stiff peak stage and fold into the pastry cream. The specks of vanilla bean will be throughout the quick Bavarian cream. Put the 3/4 cups of granulated sugar in a saucepan with 1/4 cup of cold water. Moisten all the granules of sugar. Put the egg whites into the bowl of a heavy duty mixer and begin to whip them on a moderate speed. When the egg whites become frothy and white, add the 1/4 cup of granulated sugar to the egg whites in a thin stream. Whip the whites until they form stiff peaks. While the whites are whipping, heat the sugar and water to 240 degrees. I use an infrared thermometer to read the temperature which is enormously helpful. When the sugar syrup has reached 240 degrees, pour it into the bowl of the whipped egg whites in a thin stream between the whip and the side of the bowl. Do not get the sugar syrup on the wire whip or it will make a mess and you will lose some of the syrup. Whip until cool and add the pound of unsalted butter in chunks. Whip and blend thoroughly and then add the vanilla extract. If the butter is too chilled still, the buttercream will look like cottage cheese. If you add the softenend butter to the egg whites before they have a chance to cool, then the buttercream may be too thin. Getting it just right is a trick that takes practice but once you know how to do this, this buttercream is the buttercream for wedding cakes. Swiss meringue buttercream is made with egg whites and sugar blended together over a hot water bath to a temperature of 140 degrees and to me, this buttercream is better for a filling or a cake that does not have to be stacked or transported anywhere in hot weather. French meringue buttercream is the same as Italian meringue buttercream except that you use 4 liquid ounces of egg yolks instead of whites. I hope you will try making Italian meringue buttercream. The ratio is always the same and we can scale it up and down with ease. 12 pounds of butter and 6 cups of egg whites fits in our 40 quart mixer with no problems.